Most deer hunters put a ton of thought and preparation into shooting a deer but do not prepare as well for what they will do after they actually shoot one. A solid plan for how to handle your deer after you shoot it is essential if you want to maximize the quality of the venison from your kill. Here are six things to absolutely do immediately after shooting a deer. It might sound funny, but this step is critical if you want to avoid serious injury. Before you do anything to your deer, make sure it is dead. You may think it is dead, but there are plenty of stories out there about hunters who thought their deer was dead, only to have it pop up and go berserk; in some cases causing injury, or even death. This is a critical step in the process. Field dressing should be done immediately after killing the deer. Make sure to carry a sturdy, sharp knife (or even two) with you to make sure you can do the job quickly and precisely. One of the most important points to focus on in field dressing a deer is to avoid puncturing any of its organs. If you do puncture an organ, it can result in a tainting of the meat and adversely affect the flavor. Remove the internal organs and as much of the windpipe as is possible. During this process, try to minimize any dirt or fur getting inside the deer. Ideally the best way to transport a deer is to lift it directly onto a trailer and drive it to your destination. However, often this is not possible due to the terrain or location. 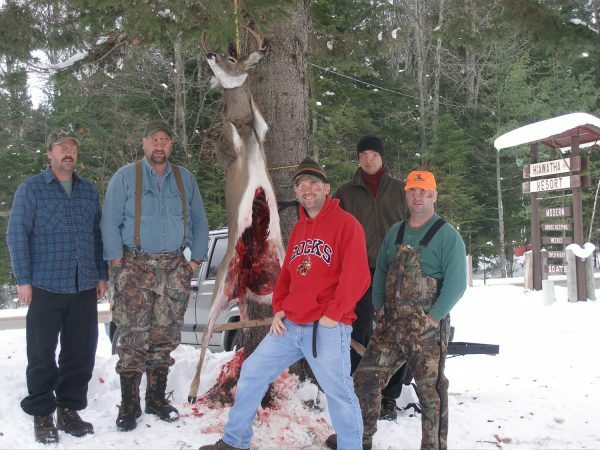 In many cases, hunters must drag their deer out of the woods or field. If you must drag your deer out of the woods it is best to lay it on a tarp to avoid contact with the ground. Whatever you can do to minimize the amount of dirt and debris that gets inside the deer, during transport, will be a benefit to you in the process. Once the deer is transported to your destination, you should immediately hang it, so it is not touching the ground. Some hunters prefer to hang it head up, while others prefer to hang it head down. The key is to hang it, because this lets remaining blood drain out of the deer. Once the deer is hung, take a saw — preferably a hack saw — and cut through the deer’s ribs. Then take a piece of wood or other object and pry it into the cavity to open it and keep it open. You also want to get the hide off the deer as quickly as possible, because fur is an insulator. With the hide removed, the meat will cool more rapidly. At this point, some hunters like to rinse the deer with water. While this does remove debris and cools the meat more quickly, moisture can also accelerate the work of microorganisms and increase the chances of spoiling the meat. To be safe, you can delay the rinsing process until later. If you do rinse it right away, make sure to blot as much moisture as possible from the deer to reduce the chances of spoilage. How long you hang your deer depends heavily on the air temperature. If the temperature is below 40 degrees you can age your deer longer, up to a week. Temperatures above 40 degrees will accelerate the spoiling process. In warmer temps, keep the aging process to a few days. Once your deer is aged you can begin cutting and processing the meat, whether you do this yourself or bring it to a professional. If you are doing the job yourself, have a good plan for how you are going to use the meat and do the job in a clean environment to avoid contamination. Meat should be put in the freezer immediately, unless it is going to be used right away.